The Mediterranean is an ideal for all kinds of activities and water sports, with more yet to grasp the idyllic waters of Ibiza and Formentera. 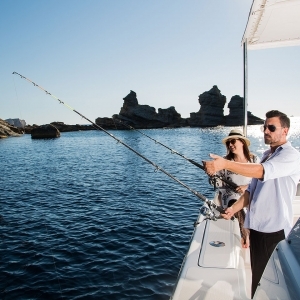 Space Boat Experience gives you the opportunity to fish in the richest areas of Ibiza and Formentera. Forget licenses or legislation, as it will be our captain who manages the necessary permissions so that your only effort is to reel in your catch from the sea. Connect to the nature of the Mediterranean and discover the secrets behind the sea of Ibiza. Next to a diving instructor you will feel like fish in water as you explore the most pristine marine corners of the Pityusic Islands. Download the ‘Ibiza classic dives’ guide. 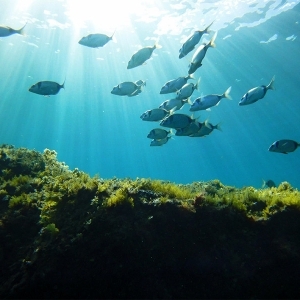 The sea around Ibiza hides a unique ecosystem. Vibrant turquoise colors, fish dancing to the current, walls of posidonia oceanica that UNESCO declared a World Heritage Site… which you can discover as soon you dive. Space Boat Experience reaches almost everywhere. However, those most difficult corners and coves to explore will always be at your fingertips if you practice paddle surf, one of the most trendiest watersports, also known as SUP (Stand Up Paddle).